Friends Don’t Let Friends Drive Drunk You Have Been Warned! You may get a call late one night from a friend asking you to come and get him or her at the police station, where your friend has been arrested for driving while intoxicated (DWI), or possibly for refusing to take a breath test to measure his or her blood alcohol concentration (BAC). Being the good friend that you are, you rouse yourself out of bed, throw on some clothes and head to the station. Now your friend wants you to take him to his car so he can drive home. He swears that he is okay to drive, that he has to work in the morning and really needs his car, and since you are such a good friend, surely you will help him out. How can you get out of this? You show your friend a piece of paper that you were given at the police station. It is an official document that says at the top in bold letters, Potential Liability Warning. This document says very clearly that if you “permit or facilitate” the operation of a motor vehicle by your friend while he is intoxicated or has a BAC over the legal limit, then you yourself can be arrested and charged with a violation of 39:4-50.22. If convicted of that charge, your driver’s license will be suspended, and you will face fines, penalties and even jail time. 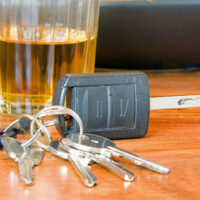 Even worse, should you allow your friend to drive while intoxicated, and he is involved in a collision where other people are injured or killed, you could be criminally prosecuted and face prison time, as well as face civil liability for personal injury or wrongful death and be made to pay civil damages to the injured persons. This document is not just handed to you at the police station. You are required to sign that you received it. If you refuse to sign it, the police officer will sign the document, acknowledging that you were given the warning. In a perfect world, you would not be tempted to let your friend drive if he or she is still intoxicated, and your friend wouldn’t put pressure on you to allow it. But if it does happen, the paper in your hand should help you make the wiser decision, and also give you a good excuse if you need to stand firm with your friend and not let him drive. Lance Brown & Associates is located in Robbinsville, NJ and serves clients in and around Windsor, Hightstown, Princeton Junction, Allentown, Crosswicks, Roosevelt, Imlaystown, Perrineville, Trenton, Clarksburg, Cranbury, Plainsboro, Cream Ridge, Wrightstown, Princeton, Florence, Bordentown, New Egypt, Kingston, Hunterdon County, Mercer County, Middlesex County, Monmouth County, Ocean County and Somerset County. © 2013 - 2019 Lance Brown & Associates. All rights reserved.